Physical characteristics: The male king bird of paradise can be spotted by his brilliant red coloring and two long, wire-like ornamental tail feather shafts, which are tipped at the bottom with a circular swirl of bright green feathers. His underside is white, with a green band across the chest. The male also has a black spot over each eye. Both male and female have blue legs and feet; the female's coloring is much more subdued with an olive-brown back, head, and throat and a variegated buff chest. Both are about 6.3 to 7.25 inches (16 to 19 centimeters) in length, not counting the added length of the male's tail, which may be as long as the body. Geographic range: The species is found on the New Guinea mainland and on surrounding islands, including Aru, Missol, Salawati, and Yapen. Habitat: King birds of paradise live in lowland rainforests, forest edges, and secondary forests. The female builds her nest in cavities of lower trees, and the male selects short, shrubby trees to perform his display (or courtship ritual) upon. Diet: The species eats both fruit and insects. Behavior and reproduction: Males perform their courtship ritual of persistent calling and displaying of plumage in solitude rather than in a lek (or cluster of other male birds of the species). During the display, they pose with their tail wires extended so that the green disks they are tipped with are over their heads. They may also hang upside down from a tree branch. Male king birds of paradise are polygynous, and once they mate they move on to attracting the next female, while the female goes on to lay her eggs and incubate and feed her chicks by herself. King bird of paradise and people: The bright feathers and skins of the male king birds of paradise are sometimes sought after by native men of New Guinea, but for the most part the bird enjoys a harmonious relationship with people. Frith, Clifford B., and Bruce Beehler. The Birds of Paradise. Oxford, U.K.: Oxford University Press, 1998. Simpson, Ken and Nicolas Day. Field Guide to the Birds of Australia, 4th ed. Ringwood, Australia: Viking O'Neil, 1993. Clode, Danielle. "Kicked Out of Paradise." Nature Australia 26, no. 12 (Autumn 2001): 15. Smith, Dwight G. "On Heaven's Wings." World & 112, no. 11 (November 1997): 184. "2003 BirdLife's Online World Bird Database." BirdLife International. 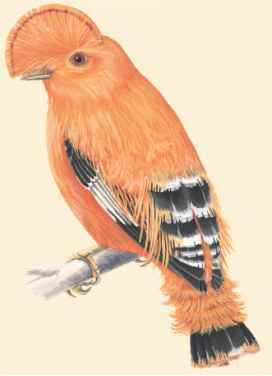 http://www.birdlife.org (accessed on June 14, 2004). "Animals of New Guinea: Birds of Paradise." World Wildlife Foundation. http://www.worldwildlife.org/expeditions/newguinea/spec_bop.cfm (accessed on June 14, 2004). Corvids, members of the Corvidae family, range in length from 7.4 inches (19 centimeters) in Hume's ground jay to the northern raven, which is 22.62 to 26.91 inches (58 to 69 centimeters) long. Hume's ground jays weigh 1.47 to 1.61 ounces (42 to 46 grams). Northern ravens range from 2.02 to 3.43 pounds (.92 to 1.6 kilograms). The Corvus genus of crows includes the crow, raven, jackdaw, and rook. These birds have shiny black plumage, feathers, and harsh calls. Jays are the colorful members of this family. 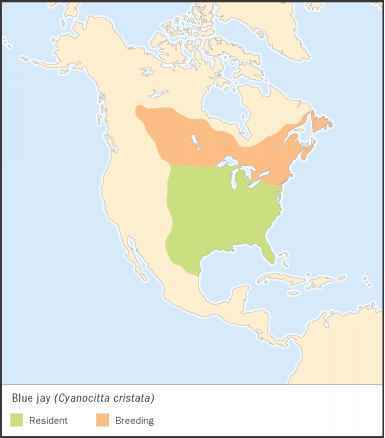 The Eurasian jay and blue jay have blue and white feathers. Magpies are related to jays and plumage (feather) color is often described in the names of these birds, like the green magpie. Corvids have strong bills. Most birds have black or dark bills, and feathers or whisker-like bristles cover the nostrils of many birds. Members of this family have large feet with strong toes. Birds use their toes to hold onto prey, the food that they hunt. Corvids have long tails and rounded wings. Wing length varies with the amount of flying a bird does. Long wings are found on birds that migrate, travel long distances from one place to another. Corvids belong to the Passeriformes, song bird or perching bird, order. While other birds in this order sing sweetly, the corvids' loud, harsh calls are described as screeching or croaking sounds. Corvids are located throughout most of the world. They are found on all continents except Antarctica. Members of this large family live in habitats ranging from treeless tundras where land is flat to mountain forests. Birds live in deciduous forests, where trees shed their leaves, and coniferous forests, with cone-bearing evergreen trees. Corvids range in deserts, grassland steppes where there are few trees, and on the edge of rainforests, where heavy rain produces much growth. In addition, corvids live in cities and small villages. A prime example of crows' intelligence is how birds solve the problem of getting food. Hooded crows in Finland know that lines left in the water by fishermen lead to food. The birds use their bills and feet to pull up the line and get fish. And in New Zealand, New Caledonian crows make tools out of leaves. Bird use the hooked tools to get hard-to-reach insects. Corvids mainly eat seeds and nuts. However, they are omnivores, eat animals and plants. These birds are scavengers and take food from places like garbage dumps. Another corvid habit is hoarding food. Birds hide food, often burying it. They stockpile food for times like winter when there is a shortage of seeds and nuts. Corvids are family-oriented. Many species travel in a flock, a group of birds. Birds in this group are monogamous (muh-NAH-guh-mus), with a single male mating with a single female. The female corvid lays from two to seven eggs. Females incubate the clutch of eggs, sitting on them to keep them warm. Older offspring act as cooperative breeders, helping the parents protect and rear young. The male and the older offspring feed the female. They also protect the female from predators like cats, hawks, and people. A mob, usually a group of crows or jays, will fly after hawks and owls. The corvids yell loudly, scolding the birds as they chase them away. Corvid eggs do not all hatch at the same time. The young birds stay in the nest from five weeks to three months. People have mixed feelings about corvids. Birds can imitate human words and have been kept as pets. However, people have also killed corvids to prevent damage to crops and cattle. Corvid names have long been used to describe negative traits in humans. For example, to crow means to brag, and to rook is to cheat. The little-used verb raven means hunt for prey, and ravenous means extremely hungry. A jay is a foolish person, and a magpie is someone who chatters or collects many things. According to the World Conservation Union (IUCN), the Hawaiian crow is Critically Endangered, facing an extremely high risk of extinction; four species are Endangered, facing a very high risk of extinction; eight species are Vulnerable, facing a high risk of extinction; and eleven species are Near Threatened, in danger of becoming threatened with extinction. The primary cause is the destruction of habitat as trees are cut down.